A crane being used to repair a power pole in Campbell fell on a house's roof and a fence on Sondra Way, police said Tuesday afternoon. No injuries were reported when the crane came down just before noon. The crane was being used by a PG&E subcontractor making repairs to a power pole on Sondra Way, PG&E said. Aerial footage of the scene showed substantial damage to at least one home's roof. PG&E said two homes were damaged. It was not immediately known if anyone was inside the structures when the crane fell. Resident Betsy Perry said her shed was one of two hit by the crane. She heard it come crashing down. A crane repairing a power pole in Campbell fell on a houses roof and a fence on Sondra Way, police said Tuesday afternoon. Ian Cull reports. "It didn’t hit the house, but it was a huge boom crashing noise like I had never heard before," she said. "Before it happened, I wasn't concerned at all because they said we do this all the time." PG&E said 26 customers went without power Tuesday afternoon. The power had been shut off before the repair work began, police said. PG&E crews were at the scene working to restore power. Crews from King Crane, contracted by PG&E, were replacing a power pole in a backyard when the crane toppled. The crane is a 2011 Link-Belt registered to Bigge Crane and Rigging Co., according to Department of Motor Vehicle records. One neighbor who works in construction was puzzled by the move to extend a crane that large through a neighborhood for one power pole. "It was overextended," resident John Franks said. "You can only reach so far with a crane, and if the weight shifted the wrong way, it's going to go down." Late Tuesday night, crews were still trying to remove the crane that's estimated to be about 200 feet long. They said it could take until midnight. 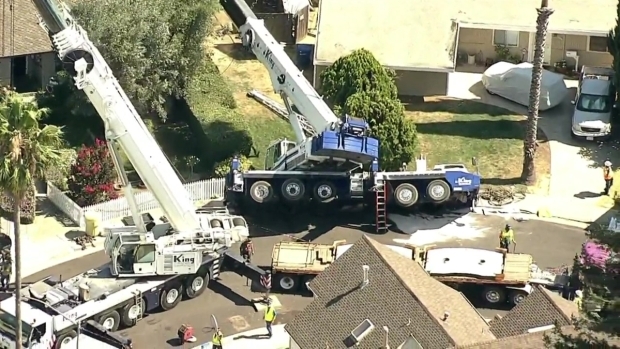 A crane repairing a power pole in Campbell fell on a roof Tuesday afternoon. 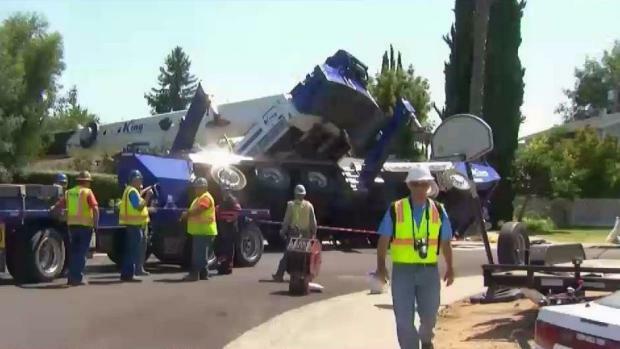 Police were uncertain of what caused the crane to topple and said the incident is being investigated. King Crane did not respond to requests for comment.